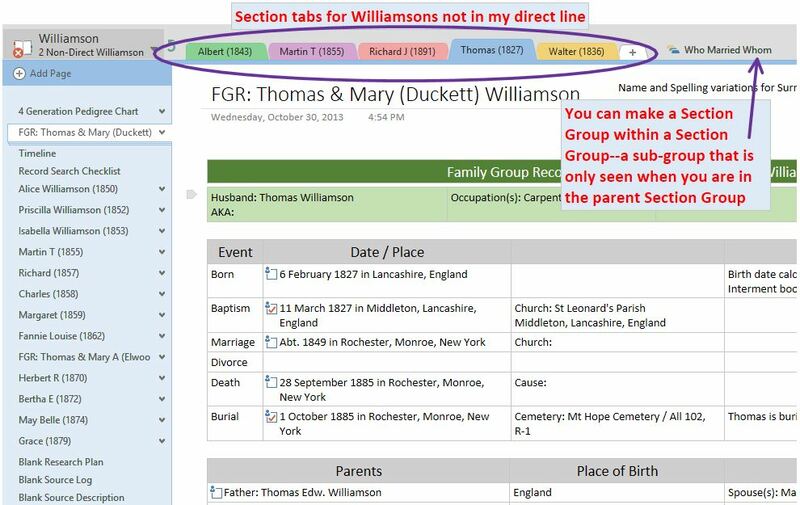 I have been busy behind the scenes working on updating my old OneNote posts, putting together some new posts and working through the Genealogy Do-Over Topics. The Research Log dilemma has me in a holding pattern where I am currently stuck in the topics for Weeks 3-5. Anne Faulkner’s (Ancestor Archaeology) Do-Over recap post had me laughing and nodding my head in complete agreement. There have been a couple of questions about organizing Section tabs and Pages for each person so I thought I should address how that has evolved as I have been working in my Williamson Surname Notebook. Basically, I have changed the Section Group setup by adding a third group. Originally I had only two Section Groups created to hold Sections for individuals in my family tree. One for the direct surname line and another for non-direct names organized alphabetically. As I started adding more and more Sections to my notebook for each person, it became apparent that this setup wasn’t going to work for me in the long-term so I reorganized the groups. For now I have three Section Groups. Section Groups alphabetize themselves and I wanted my Section Groups in a certain order so I added numbers to their names. So rather than think that each Section tab was for an individual person, it should be that they are for a family group. (Banging my head against the desk and saying, “Duh.”) I haven’t yet decided if I am going to keep the naming convention I originally set up [male name only] or rename the Sections to include the wife/mother’s name. If I switch to adding the wife/mother’s name to the Section tab name, I was thinking I would have to add a new Section for subsequent marriages. That hasn’t been an issue for my direct-line ancestors; but as I get more into the collateral lines, I will have to give this a hard think. This is the Direct Line Section Group for my Williamson Surname Notebook. In each Section are Pages for people in the family group. The last Section Group is for lines that have ‘married into’ my surname. Obviously that includes some new direct line surnames as well as husbands to Williamson females. For the surname for my great grandmother, great-great grandmother and on, I have created separate Sections in the front of the A-Z tabs for them. Instead of a separate Section, each family group gets a Page with Sub-Pages. 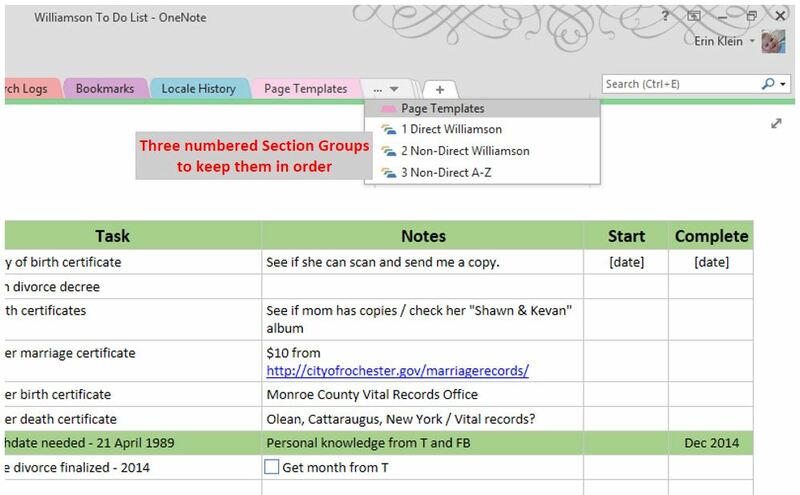 If the Section gets too cumbersome to navigate (too many pages of family groups), they can be moved into their own Section Group or even their own Notebook if needed. Right now, that isn’t been a problem and I’ll think on it when I have to. I hope that helps you understand a little bit better how I have been organizing my family groups in my Surname Notebook. 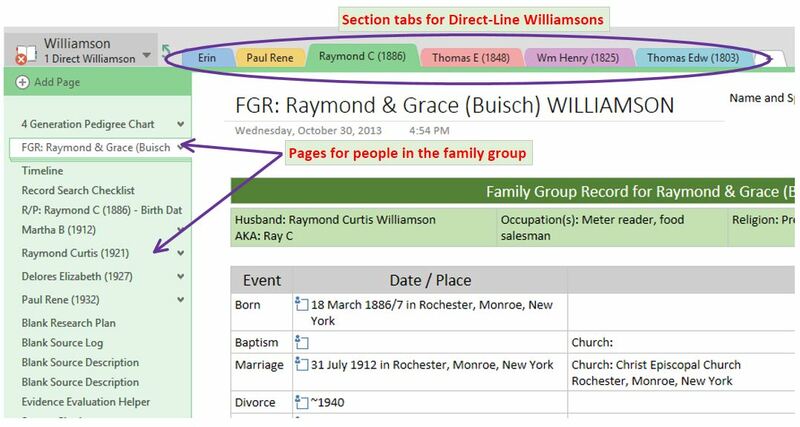 Erin Williamson Klein, “Part 2 – More Quirks – Section Groups & Sections.” My Family History Files, 20 February 2015 (http://myfamilyhistoryfiles.com/research-plan/surname-section-groups-and-sections/ : [access date]). This one about sections helped me tremendously. I am making great progress this past month because of your patience in explaining your methods. Quilting is often synonymous with genealogy ! I am glad I was able to help out! 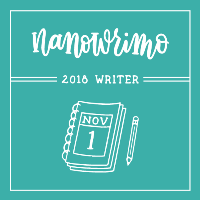 I have updated the post on pages so you might want to have a look over there, too. Your series on OneNote has been extremely helpful. 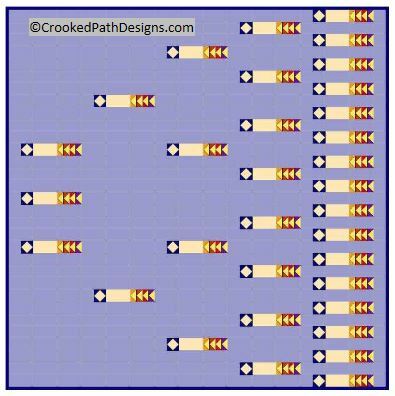 I did have a question for your overall Notebook setup, do you have your Maternal line in the same Notebook, or is it a separate one with the same setup/layout? I haven’t started organizing my the notebooks for my mother’s lines yet. Eventually, I will have four notebooks all set up the same way. One for each of my grandparents’ surnames so 2 for my paternal line and 2 for my maternal line. Hi Erin, Do you have a suggestion for setting up surname files for Patronymics? My maternal line is from Denmark and Sweden. I have looked at using areas that they lived in as the “colored coded” filing system uses but that doesn’t seem to work for me. ~ Each person would then have subpages like: Birth, Baptism, Marriage, Divorce, Death, Jobs, Immigration, Bios, Timelines, etc. under their name. ~ Then when I get to working on Alec, I would create a new tab for him. I’d copy the Family Group Sheet template over. Then I would go retrieve his page + subpages from his parents section and move (not copy?) them to Alec’s section. Perhaps leave behind a page which links over to his own section group. Also, for each family group, you can add pages for property they owned or anything else of interest.